With the end of the school holidays, visitors may be forgiven for thinking that the Museum activities wind down. In fact, this past four weeks have seen the Museum team getting out and about across a variety of locations. Here’s a few details of some of the places we’ve been travelling to just recently, both to meet other aviation friends and also to reach out to spread the word of the Yorkshire Air Museum to a wider audience. 4th of October saw an entire coach load of Museum staff and volunteers on a trip to Lincolnshire. The two destinations were Thorpe Camp and RAF Scamption, home to the Royal Air Force Battle of Britain Memorial Flight. 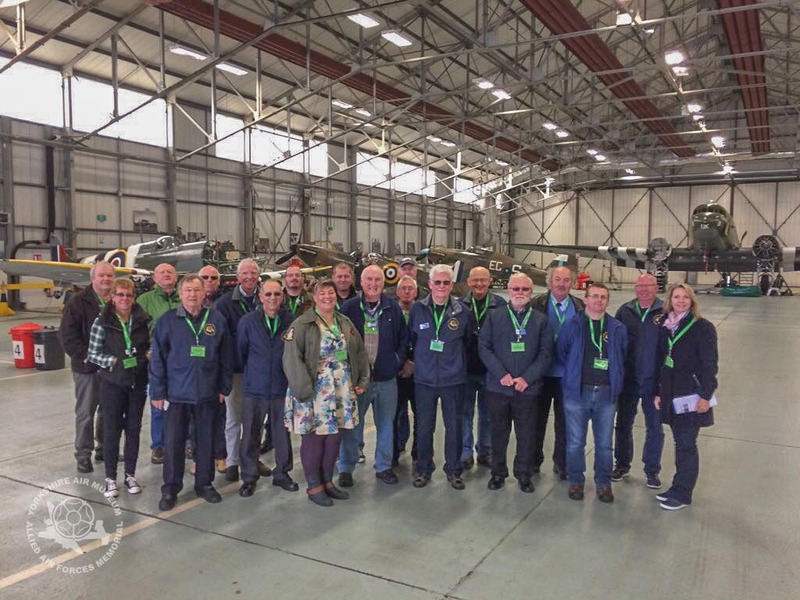 A much anticipated trip, it was an opportunity to meet some of the team that bring us the wonderful fly pasts overhead the Museum each summer. The chance to talk to the engineers responsible for keeping these beautiful aircraft airworthy and see them at close quarters was a truly memorable event. On the same day, the team also visited Thorpe Camp. Formerly the home of 97, 619 and 617 (Dambusters) Squadrons who all flew from RAF Woodhall Spa in the 1940’s Thorpe Camp is a surprisingly informative location. Our team could easily have spent more time there and some are planning a return trip soon. On the weekend of the 6th to 8th of October, our friends at RAFA Sud Ouest France Branch travelled to the RAFA European Area Conference in Dublin. Citizens of the Republic of Ireland have always been able to serve in the British Armed Forces. However, during the troubles in the North, it has sometimes been difficult for British Veterans to pay homage in Eire to those Irishmen that have fallen whilst serving in the British Forces. However, this year for the very first time, the Royal Air Forces Association(RAFA) held its European Area Conference in Dublin over the weekend 6-8 October hosted by the Republic of Ireland Branch. On the Sunday morning, all the RAFA members who attended the Conference, including 3 retired Air Marshals of the RAF, attended Glasnevin Cemetery for a service of remembrance in the Chapel and wreath laying. Chairman, Beryl Dennett Stannard laid a Yorkshire Air Museum wreath at the Glasnevin Cross of Sacrifice in honour of all the Allied Air Forces airmen who died whilst serving in global conflicts. The RAFA Sud Ouest France Branch work closely with the Museum to reach out and attend as many of these ceremonies as practical as we expand our activities in this important area of Remembrance. Just a few days later on 12th October, two of our team travelled to the Birmingham National Exhibition Centre. The event was the National Group Travel Show where we formed part of a York area to present and promote the Museum as a destination for group tour operators. Alongside our colleagues at Visit York and Jorvik Viking Centre, we had a busy day answering questions and generating a lot of interest for group visitors over the coming months. Group travel visitors are a growing part of the Museum’s visitor numbers and can have quite diverse requirements, ranging from overseas coach parties through groups of friends with a shared interest all the way to troops of Scouts and Air Cadets. Our new Group Visit section of the website gives fuller details on how to book a group visit. The 19th of October saw the launch of the Museum’s Reach For The Sky educational book launch in House of Commons. Produced in collaboration with The Royal Aeronautical Society, the publication is part of an educational resource that reaches out to schools and inspires young people to become interested in aviation. Together with the great resources and information on careers in aviation produced by the RAeS, this newly updated book is available from both the RAeS and also direct from the Museum. Over 100 attendees were present at the Parliamentary reception to promote careers in aviation. The keynote speech was by Museum Honorary President and President of the RAeS, Sir Stephen Dalton. Together with Chair of Museum Trustees Professor John Edmonds and The Rt Hn Dame Rosie Winterton, they launched this new edition which incorporates more recent space programme developments and new STEM based science bytes. These events are typical of an expanding programme as the Museum reaches out beyond it’s home location of Yorkshire to help to remember those air forces personnel who served in global air conflicts, while also inspiring new vitro to come to the Museum and encourage a new, younger generation of aviation minded people to learn from history and perhaps forge a career in aviation one day in the future.